Cultivating Concepts: Me? A Winner? How About You? Just a quick reminder today is the last day for my giveaway. Winner will be announced tomorrow...or Sunday depending on how exciting busy my weekend is...but now on to MEEEEEE I'm a winner!! 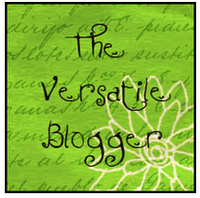 Erika at The Honey Bunch has given me the Versatile Blogger Award!!! How sweet is that?? Thank you Erika. You made my day! 1. Thank the person who presented the award to you and link back to them. Read above and thank you again Erika. Well let’s see…1. The last time I tried I could still do the splits, but I have to admit that was about two years ago… So I’m not sure if that is still true, so I’ll say up to the age of 45 I could still do the splits and I once I even did them on stage in front of the entire school…what was I thinking? 2. I have never, ever, ever tried smoking. My dad was a BIG smoker and I couldn’t stand it… so I have never even had a cigarette in my mouth, lit or unlit. 3. I want to write children’s books, which a lot of people know about me. But they may not know I submitted a story to six different publishers and I got two rejections and nothing from the rest. I was excited to get the rejections; at least I know they read it. 4. I am the shortest person in my family. My husband is 6’2 my son is 6’1ish and my 17 year old daughter is 5’11 and I am 5’7which isn’t too short unless you live in my family. 5. I cannot stand the feel of the cotton in pill bottles. It has a weird squeak to it and it makes my skin crawl kinda like fingernails on a chalkboard. I make my husband pull it out of the Advil bottle. 6. I was a hairdresser for the first fifteen years of my grownup life. I went to college for the first time (not back to college) when I was 30, continued to do hair for a while, then graduated college (the first one in my family) when I was 35. My son was in kindergarten, my daughter was a year old. This year my son graduates from the same college (OSU) and my daughter has just been admitted there for the fall. I started graduated classes there last fall…I wonder if she will let me room with her? 7. I married the boy I dated in high school almost 30 years ago. It was probably the smartest thing I have ever done. So there I am in a list of seven things…well some of me anyway. And now on to the HARD part, how in the world am I ever going to pick ONLY 15? This is going to take a while so I think I will get back with my 15 later. I promise. Oops. I copied the wrong thing. Let's try this again!! lol if you met my family Kristin you would feel like you were in the land of the giants! My mother in law is only 5'1! My dad went to college for the first time at 47; he was actually in classes with my youngest brother! Good for you; your life sounds wonderful! I think it's great to hear your stories, & loved about the cotton. I don't like that canned biscuit explosion & leave the room if we ever have them, which we don't much any more. Scary! Congrats on your award! First, I'm mad at you! How come you didn't tell your bestest teaching buddy about #3!!! Second, You are an awesome writer & one day when I'm over being mad at you, I'll pray it happens for you! Third, thanks for the reminder about your awesome skills as a hairdresser. When can you work me in? Linda I KNOW!!! I don't like those biscuit cans either!!! lol My hubby has to do those too! And D. I thought I had told YOU and any time. Cutting it ALL??? And Thank you!